One grammar point that comes up again and again in academic writing class is the misuse and overuse of dependent clauses. My students commonly include sentence fragments, forget dependent words i.e. relative pronouns, or attempt overly complex sentences with clause upon clause upon clause. While at higher levels, they know grammatical principles on how to construct them, their application of these principles dissolve in their own writing. I find it’s valuable to rediscover types of dependent clause construction (and deconstruction) among the class, but it’s also more meaningful when not appearing as its own lesson, but when it stems out of a broader purpose and set of materials. I prefer to break these up into smaller chunks and integrate them into something else I’m doing with the students. I was reviewing understanding from these texts and practising summarising skills. In doing so, dependent clauses seemed appropriate to integrate all of a sudden. It’s also one thing to use a prepared lesson with sample sentences (huge thanks to dedicate teachers in my group for it), but I also highly value creating spur-of-the-moment examples both from myself and the learners to use. I intend here to show how both worked in tandem on this somewhat dry, grammatical concept. This is an excerpt of about 30 minutes from this class. Student sentences: On a shared Google doc, I asked students to summarise a point made from each text into one sentence. Doing so got all students on task since everyone could see each other writing. Teacher sentences: I did the same on another Google doc projected on the screen using differing constructions on purpose. I excluded in-text citations (this once) to focus solely on one dependent clause in a sentence. Banning accessories that are considered ‘conspicuous religious symbols’ may only create the illusion of religious neutrality. The considerable reach of the medium makes it crucial to assess messages that audiences take away about gender in these videogames. Instead of relying solely on English, Australians may need to use the national or regional languages in which much of Asia’s populations operates. The considerable reach of the medium makes it crucial to assess messages that audiences take away about gender in these games. Instead of relying solely on English, Australians may need to use the national and regional languages in which much of Asia’s populations operates. This was to reiterate that clauses have both subjects and verbs that match each other and that if there are multiple subjects or verbs, but no conjunctions, one subject and verb must be within a dependent clause. Otherwise, we have a problem. Student sentences: I put students into pairs to examine each other’s sentences on the Google doc. We noted that not all their sentences necessarily had multiple subjects and verbs, which was fine. If trouble occurred at this point, partners could clarify meaning and edit sentences to ensure at least a main subject and main verb appeared and agreed. Teacher sentences: Next, we deconstructed the clauses by identifying (the entire adjective clause) in each. We reiterated that adjective clauses typically begin with certain types of words (students listed relative pronouns from their memory). Banning accessories (that are considered ‘conspicuous religious symbols’) may only create the illusion of religious neutrality. The considerable reach of the medium makes it crucial to assess messages (that audiences take away about gender in these games). Instead of relying solely on English, Australians may need to use the national and regional languages (in which much of Asia’s populations operates). Student sentences: They did the same on their partners’ sentences. If no adjective clauses existed, then so be it; sentences were left untouched. If a subject, verb, or relative pronoun seemed to be missing, partners identified these issues and helped each other to add them in. I walked around to help facilitate this correction. Teacher sentences: Finally, we withdrew the adjective clause into its own second independent clause. This highlighted the meaning and function of each relative pronoun through discussion of what duplicated words in both sentences they replaced. a) Here, partners pulled out the ADJ clause into its own independent clause, colour-coding and underlining like we’d done together. If none existed or it was an adverb clause, we left them alone. No worries. Get to them another time. b) Since everyone had read the same texts throughout the term, I asked them to identify a noun in their partners’ sentences that they could give more information about based on their understanding of the text. They then added a second sentence about this noun. Teacher sentences: We went through the exercise of replacing the duplicated words with the appropriate relative pronoun, moving the pronoun (and preposition in the last case as a formal approach) to the front of the dependent clause, and moving the entire dependent clause to just after the noun it gives more information about. And back to the original sentences we arrived. a) They returned to their own sentences to identify the subject, verb, and duplicated words/ideas in the new sentence and then construct the two sentences together. Doing so on Google docs allowed students to be able to use the same formatting features as I had used to do these constructions (you never know what type of pens or paper they have in class) and it gave me the opportunity to monitor and make comments synchronously. b) I then switched from my Google doc to theirs and projected it on the screen. I worked through some sentences by highlighting problematic issues and fixing them together and/or gave them a thumb’s up (I checked the rest after class). It also gave me the opportunity to double check their understanding of the text itself. Today, Trudeau issued an apology to the LGBTQ+, particularly from government, military, and police. The Government of Canada endorsed this apology. The LGBTQ+ community suffered many hardships over the years. These included humiliation, systematic oppression, and criminalization. Trudeau was not Prime Minister during these years. 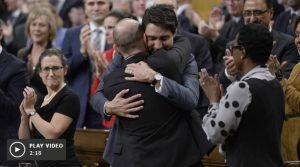 Today, Trudeau issued an apology (that the Government of Canada endorsed) to the LGBTQ+ government, police, and military community (who suffered many hardships [which included humiliation, systematic oppression, and criminalization,]) over the years (during which he was not Prime Minister). IC + DC + DC + DC + DC. Maybe four dependent clauses is a bit too many? I suggested that sometimes their own sentence construction includes this wordiness and that meaning can get lost, especially when dependent words, subjects, or verbs are missed. I then challenged them to rewrite this sentence, limiting to no more than two DC but retaining meaning. Do you want to give it a try? ;) Next lesson: concision. In the end, I know using authentic materials and learner-source material is nothing new, nor is integrating grammar into classes without letting it drive the syllabus, but do we always practice what we preach? In this case, I did. Looks good. It can be really tempting to just use stuff in an existing text and analyse it, get learners to make their own little sentence isotopes and check it for integrity but this looks like an interesting way to use learner-generated texts. Cheers! Cheers, mate. I don’t see fault in doing the typical bits and bobs with grammar, but it just makes more sense to bring it up as needed.